Nereabolis Cross (KJ12), Islay. 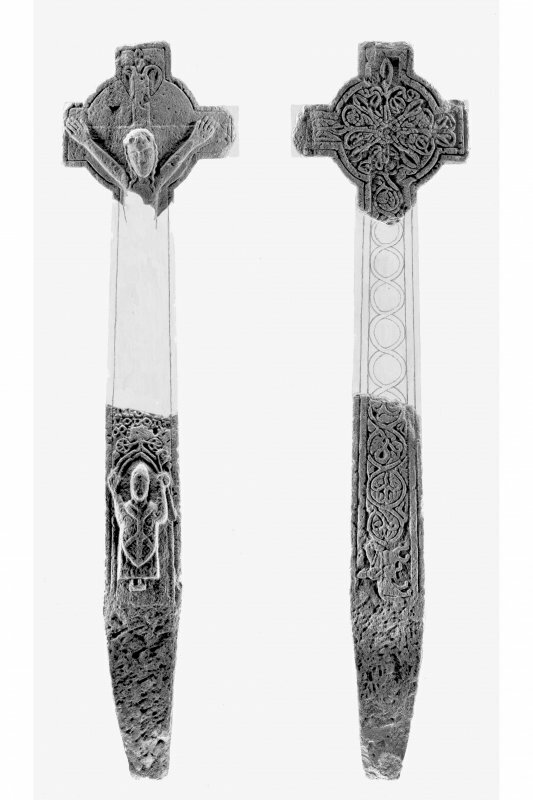 Photographic reconstruction of fragmented cross, obverse and reverse. from E to W by 4.7m transversely within walls about 0.9m in thickness. It is constructed of local random rubble masonry, and the visible stretches of walling preserve traces of lime mortar. The entrance-doorway probably occupied a position towards the W end of the S side-wall, and there is a mural recess of indeterminate purpose further to the E in the same wall. The floor of the E end of the building is set slightly above the general level of the interior, probably as a result of later burials and field clearance, and the band of stony debris that demarcates the change in levels appears to have no structural significance. In the area immediately to the S and lying parallel to the chapel are the turf-covered vestiges of an oblong building, associated apparently with a low crescentic enclosing bank which consists mainly of field-clearance material. apart, (Graham 1895) is now fully enclosed. It contains a number of private burial-enclosures of 18th- and 19th-century date, and it is probable that the medieval stones now or formerly in this area (infra, numbers 1,3,9, II) were appropriated at that period. Graham's plan, and numbers 7 and 8, recorded by Graham in the same area, could not be located at the date of visit. burial-ground bears the date 1746. '[This is the cross] of Niall son ofAed'. Bannerman; Graham 1895; PSAS, 61 (1926-7), 151 and fig. 10, no .4). lona school,14th-l5th century. flanked by plant-scrolls, that on the right terminating in a leonine creature and the other in a griffin. (Graham 1895). lona school, 14th-15th century. worn. The decoration of this slab closely resembles that of number 2. (Graham 1895). lona school, 14th-15th century. central sword resembling that on number 2, flanked by plant-stems. lona school, 14th-15th century. foliated cross with plaited centre, linked to plant-stems flanking a sword similar to that on number 2. The plant-stem at the right is of undulating type while the other has a central stem flanked by pairs of leaves. At the foot there is a rectangular panel, perhaps intended for an inscription. (NMAS cast; Graham 1895). lona school, 14th-l 5th century. slab is occupied by three animals whose tails are linked to plant-stems. (Graham1895). lona school, 14th-15th century. is derived from the Old Irish Daire (modern Doire) (oak-wood). '* (Graham1895). Probably lona school, 14th-early 16th century. by an inscribed panel, a hare and hound, and a strip of interlace. At the foot of the slab two hounds pursue a stag. HIC lACET [?T]ERL/[?ETUS] . . .
(GAGM cast, no. 188; Graham 1895). Kintyre school, 15th century. with lobated pommel and inclined quillons on the right side of the slab. (Graham 1895). 14th-15th century. followed by a sword resembling that on number 2, flanked by plant-scrolls which on the right issue from the tail of a griffin. At the foot there is an inverted galley with furled sail and a figure in the stern, 14th-15th century. the work of the lona and Oronsay schools, and the slab was probably produced locally in the 16th century. For chapel and burial ground(s), see NR25SW 2.